A study by Germany’s Federal Film Board (FFA) paints a bleak picture for the future of cinema going in Europe’s largest economy. The report finds that after a strong 2015, cinema attendance is set to decline by one to two per cent annually from 2016 onwards. The research was conducted with the support of GfK, PwC and Goldmedia, in preparation for the upcoming revision of the Film Support Act (FFG). 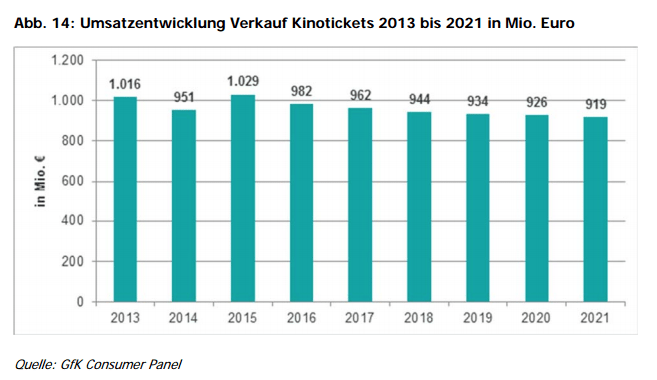 The forecast extends to the year 2021 when a box office of €919 million is predicted for Germany. The cumbersomely named “Evaluation Report on the Development of Tax Revenue in the Context of the Economic Situation of the Film Market in Germany” (PDF link) evaluates how public funding, through income and distribution for various film media consumption, production and distribution platforms has shifted over the past decade. It also looks at the current state of cinema, before prognosticating future trends. Decline in attendance in the future is attributed to “shifts of the visitors patterns towards older audiences with lower attendance frequency”, “negative exchange relations towards digital hire”, a “flattening inflation curve” and stagnation of cinema advertising. The report does acknowledge some positive trends, such as the growth of ‘alternative content’ (event cinema), the growing importance of regional film offerings and the development of the cinema as a premium consumer format. The study also did not capture cinema going patterns of cinema patrons under the age of 10, so whatever hope of changing the situation lies with cultivating the next generation of potential cinema patrons, if they can be lured away from their smartphones and tablet devices, with bold audience-building schemes such as those in France. 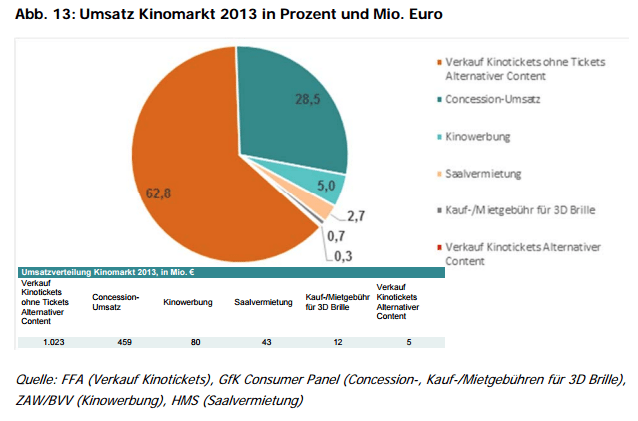 The report gives a good overview of cinema revenues, though dating from 2013, in terms of breakdown between ticket spend (films), concessions, cinema advertising, theatre rental, sale of 3D eyewear and ticket spend (alternative content/event cinema), both as a percentage and in millions of euro (above). Yet quoting GfK the report predicts a -10% decline for cinemas by 2021, not due to lower overall consumption of films but a consumer migration to cheaper online platforms, such as Netflix. Similarly it notes that physical home media consumption (DVD and Blu-ray retail and rental) has been slowly but steadily declining since 2004 to 2013, with the arrival Blu-ray not making up for the decline in DVD sales. 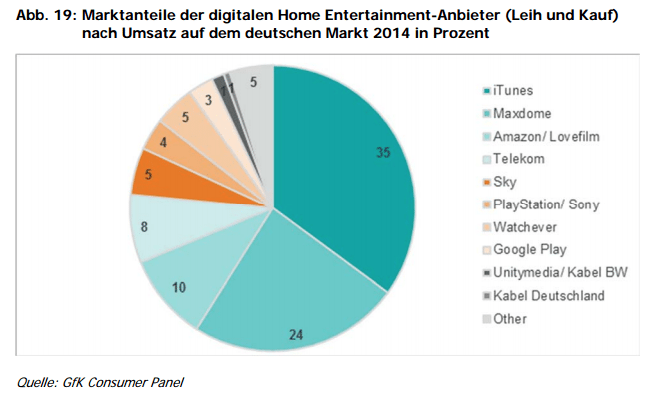 Netflix arrival in Germany is too recent to figure in the report, which for on-line film distribution (rental and download-to-own) is instead dominated by iTunes, Maxdome, Amazon/Lovefilm and smaller players. There is also a long section examining the role and outlook for television, which is dominated by major free-to-air broadcasters in Germany, with Sky’s pay-television platform only having a small recent impact.